Nezadržno se bliža velikonočni čas. Torej sem se tudi jaz odločila, da naredim voščilnico, ki bo nekako sodila v ta čas. Nastalo je tole. 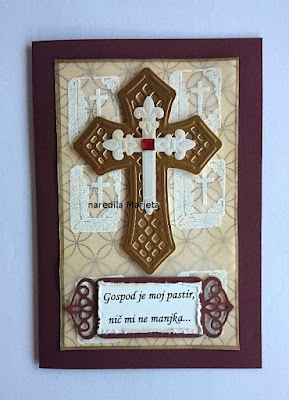 Za izdelavo voščilnice sem uporabila: barvast karton, pavs papir, štampiljke Viva decor in Just right (ozadje), bel embosirni prah, barvasto blazinico Memento - Rich Cocoa, rezalne šablone Spellbinders in kristalček. Napis je narejen s pomočjo računalnika. This is a wonderful Easter card, such a lovely traditional design. The embossed images behind the die cut crosses are lovely. Thank you so much for entering our 221st challenge. We are always delighted to see your entries and appreciate your inspirational creativity. Wow I love this card and the crosses. The gem in the middle is a perfect touch. Thanks for sharing over at Inspiration Destination. The is so elegant and beautiful. Thank you for joining our challenge at Craft Your Passion. We would love to see you again! What a fabulous creation! Thanks for joining us at Love To Scrap! Challenge Blog! Hope to see you again soon!! HUGS! Love your elegant card. We are so blessed with your participation in our previous Challenge and would love to have you back for our current Challenge at Word Art Wednesday. I want to share with you the inspiration of God's Word from Habakkuk 2:3-4 and it says, " For the revelation awaits an appointed time; it speaks of the end and will not prove false. Though it linger, wait for it; it will certainly come and will not delay. “See, the enemy is puffed up; his desires are not upright— but the righteous person will live by his faithfulness---." Have an awesome week! Thank you for joining us at scrapbookstampsociety. Lovely detail. Thank you for joining in with the Sisters of Craft challenge, good luck in the voting and we hope to see you again. Crafty Blessings. Tracy SOC DT x Don't forget about our Sisters of Craft Facebook Group too where you share your makes, find inspiration and take part in mini challenges.